The HoRNet MultiComp is a compressor in vst and audio unit format that provides you with three different compression models, a VCA emulation, a FET emulation and an OPTO emulation. Every model is equipped with a special oversampling mode and a characteristic analog saturation, it also provide an high pass filter for the sidechain The algorithm makes no compromise trying to achieve the best possible quality, still maintaining a reasonable CPU load. 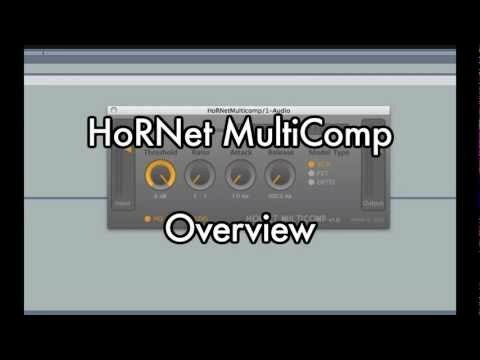 The HoRNet MultiComp has three compression models and gives you a wide palette of sound to choose from: the snappy sound of the VCA (inspired by the typical sound of 80s VCA compressors) or the fat vintage FET sound (inspired by the fast and big sound of the classic vintage FET compressor) or the smooth found of the OPTO limiter (with its peculiar program dependent release time). The Gain Reduction meter of the MultiComp visually show the compression characteristics of the chosen model. Every hardware compressor and many software one has fixed attack and release times to slow down meter action and make it more visible for the human eye. MultiComp’s gain reduction meter moves at the same speed of the compressor detector so that you can visually see attack and release times, but sometimes your compressor moves too fast so we aded a handy peak hold display that shows you the maximum gain reduction applied in the last 2 seconds. I have prepared some generic preset that you can use in your sessions, remember, these are just a starting point, you must tweak them to suit the content of your tracks. All these presets assume that the input signal is around 0VU so tweak the input knob so that the input meter flashes red on peaks but for the most of the time it stays yellow.